The price shown is one half down to get your amp on order. The JJ 323 is the 2A3 version of the JJ 322 amp. It utilizes a pair of 2A3-40's per channel running in a true class A parallel output topology. Utilizing a zero global feedback design and custom wound double C-core output transformers, JJ is able to achieve a tremendous 20 watts of Class A power per channel. 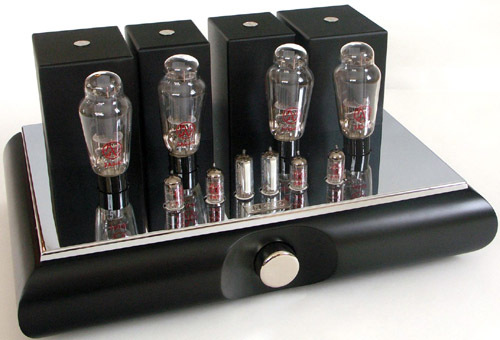 To hear a proper 20 watts per channel from a Class A filamentary triode driven amp is truly stunning. JJ rounds out the platform with an ECC83S, E88CC and EM84 seeing eye tube (level indicator) per channel. What brings the JJ 323 to the next level is the custom built-in-house C-core output transformers. Heavily interleaved, vacuum potted and designed form the ground up to deliver all the power possible from the JJ 2A3-40 tubes. Shipping: These amps are big and weigh about 100 Lbs! We typically ship them by FedEx 3 day service however we will contact you so can choose how you would like it shipped. General: This is basically the same amp as the JJ 322 with the exception of the power tubes which are the JJ 2A3-40's. The amp has a very high input sensitivity. With an input sensitivity of 350mV (50KOhm input impedance) for maximum output, a separate preamp is not necessary for most digital sources. Pre-Amp: Although the JJ 323 is a dedicated stereo power amp, it does have a master volume control for both channels (hi-spec Alps control) and high input sensitivity. With most digital sources a preamp is not necessary although the matching JJ 243 is a stellar addition. With phono setups typically you need a dedicated pre with a minimum 60db+ available gain for low output MC carts. With this setup 40-50db of gain is sufficient for most listeners. Speaker choice: Generating a true 20 watts per channel you're no longer relegated to high efficiency speakers for rock n' roll volume levels. Any transducer over 90db efficiency is enough to drive most listeners out of a 600 square foot space... The speakers we use for HIFI shows are the Klipsch RF7's. These do an astonishingly good job and they come in at a price that's accessible for most enthusiasts.